The theme of the edited book acknowledges the multiple meanings of quality tourism experiences, the diverse contexts in which tourism occurs, and the varied stakeholders associated directly or indirectly with the phenomenon of tourism. "Quality tourism experiences" is a widely used phrase in tourism and tourism-related texts and is associated with a diversity of meanings and usage. Meanings are ascribed by industry/business, government agencies, tourists, community and academics. The phrase is used to argue, for example, for positive social impacts, economic benefits, environmental protection, government policy formulation, discrimination between tourism products as well as issues associated with sustainability. 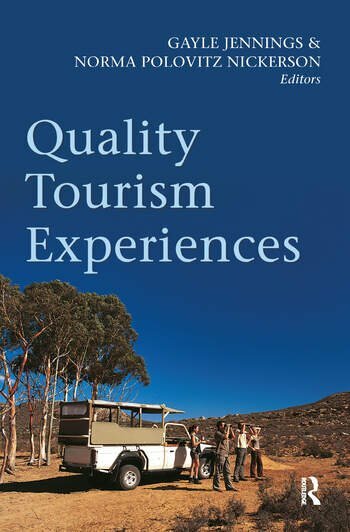 Subsequently, the phrase "quality tourism experiences" is not a nomothetic term but rather one associated with multiple interpretations and meanings. The book"s overarching tenet is that "quality" is a socially constructed term (as are the terms tourism experiences). Authors investigate the role of the mass media, the role of travel providers, the role of host communities, the role of tourists, and the role of "government" at all its levels. From an academic perspective, quality tourism experiences are associated with interaction between host and guest (tourists and community perspectives), the classification of type of tourism product (tourism industry and government sector perspectives), market differentiation and development, tourist perspectives, the notion of an integrated system and benefits from an economic perspective. Similarly, quality is associated with different meanings and is used in a variety of contexts within tourism literature. For example quality is associated with service quality, quality assurance/auditing and control, perceptions of quality at an individual/business/community level, that is, stakeholder level, and in regard to product and market differentiation. The book draws together writers from different backgrounds and interdisciplinary interests and research methodologies, as a consequence, the book provides a model of the way researchers can work together to illuminate an area and to provide multiple representations and interpretations of that area. Moreover the book demonstrates interdisciplinary, transdisciplinary and intradisciplinary approaches and collaborations.